Honestly, if the description of multiplayer competitive Jezzball doesn't already have you intrigued, I'm not sure anything I write here will help. 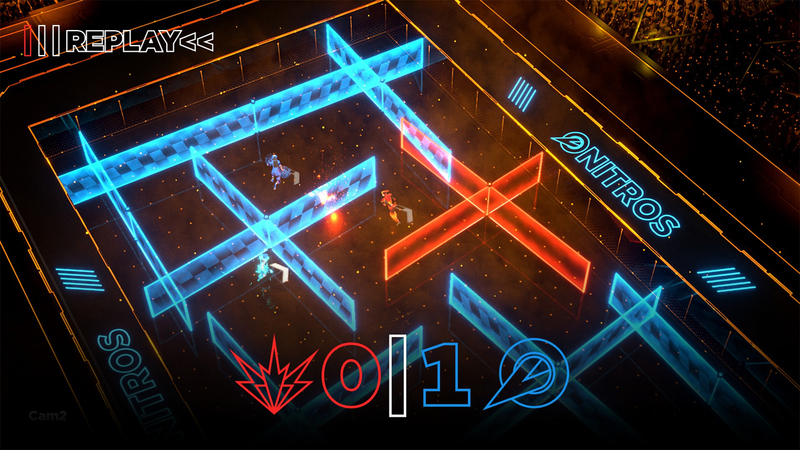 Laser League is the type of game that does not come around often: a multiplayer-only budget title that favors interesting gameplay mechanics above all else. 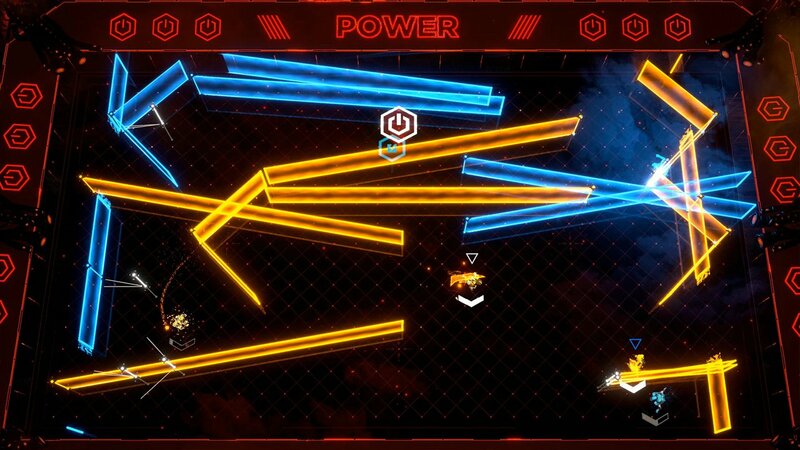 Rocket League took the world by storm when it released, and while I don't think Laser League ever gets to that status, it certainly has the potential to. Simply put: it's exciting to play. All there is to do in Laser League is run around and sometimes push a button on the controller. The absolute simplicity of the control scheme is what makes it so approachable -- an excellent point to start with as you attempt to convince a couch full of people to play it. 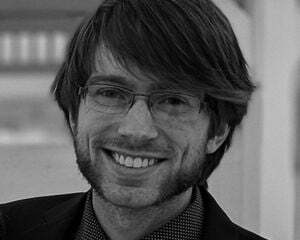 Despite the simplicity of the control scheme, the complexity of a given match ensures that there is never a dull moment in a single match; you are always paying attention to a multitude of things at once. The objective of each game is simple: eliminate all opponents. Games are either 2v2 or 3v3 and can take place on a wide array of unique maps. 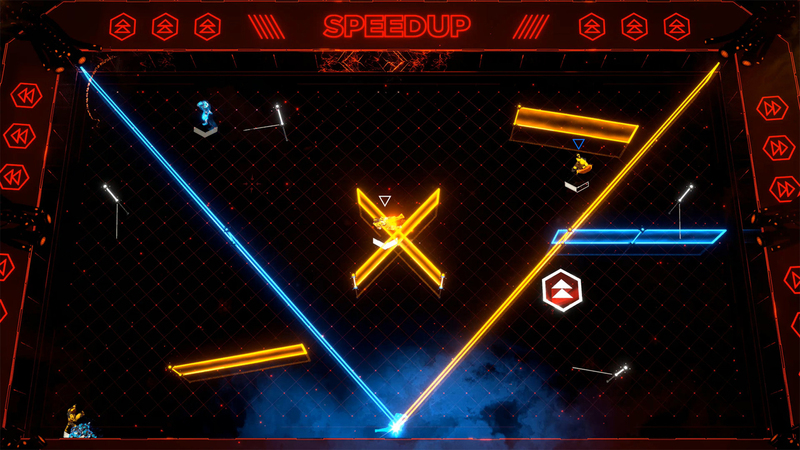 During the match, empty nodes will spawn, and the first player to touch it will create a laser wall in their color. The laser wall itself comes in a wide variety of shapes, often outlined by the empty node so there are no surprises. Running into a wall of the opposing color will kill the player, though they can be revived if a teammate walks over them. Compounding this are character classes, chosen by everyone at the beginning of each match and in between rounds by the losing team. Every class has an ability and an ability modifier. The Thief, for example, can activate an area-of-effect ability (AoE) that steals an opponent's laser wall and changes its color. This ability can be modified by either choosing to extend the duration of the AoE effect or to have the ability itself recharge faster. The modifier is always in effect and can only be changed when choosing a class. Here is a quick run-down of all six classes: the Blade can slash forward and eliminate an opponent, the Sniper creates a line on the field and can kill anyone caught in it, the Smash can bash into and stun others, the Shock can stun enemies and knock them down, the Ghost can become invincible for a short time, and the Thief can steal enemy lasers. Of the six classes, four are aggressive (actively killing/disabling the opponent) and two are more passive. The final variable in each game are the power-ups that spawn. There are far too many to list here, but they all change the game in an instant. One switches all laser walls to the opposite color, another simply makes every wall one color, others affect the speed or shape of the laser walls. The announcer will announce the power-up as it spawns in, so there's no need to memorize the icons or even glance at it. All of this happens in one of the four stadiums, each with four to five variants of laser patterns. The stadiums themselves only affect the outer set-dressing and player colors, what matters is the laser patterns. So there are effectively 19 different levels, each with their own pattern to recognize and adapt to. I originally thought that the laser walls spawning in the same pattern each time would make matches drag, but that is far from the truth. Even knowing when and where certain walls will spawn, there are so many different variables to account for, no single game plays similarly. 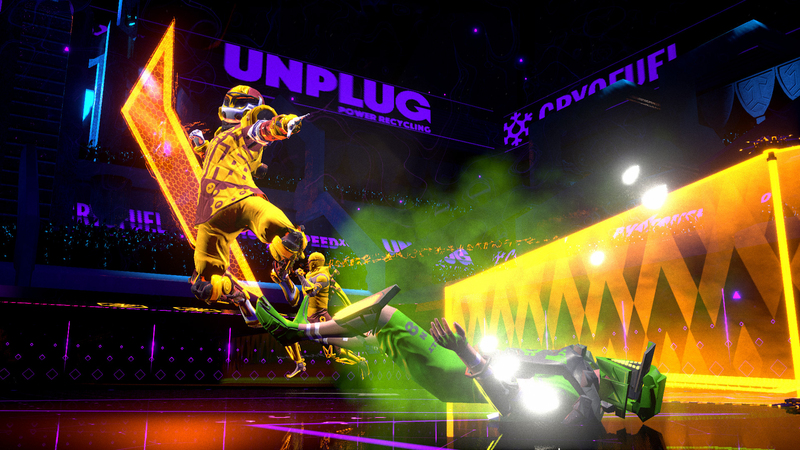 Online play is the core of Laser League, for better or worse. While it is definitely a blast online, it's unfortunate that the only way to unlock any sort of cosmetic progression is to play online. It's really not important -- everything to unlock is simply cosmetic. But dammit, they're cool! And sometimes I just want to play with local friends or against AI. Although occasionally I end up playing with AI anyway since my online teammates will often quit or get disconnected, and there is no player backfill, only AI replacements. As of now, finding a match is rather quick on Xbox, but without cross-platform play, I am always concerned about longevity. The AI, in general, is...weird. Sometimes they will make brilliant plays, even against human opponents, and other times they will stand right next to me while I'm dead and not revive me. The impressive plays balance out the brain-dead ones I suppose -- I've won an entire match online with two AI teammates against three human players. The biggest flaw, in my eyes, is the lack of any sort of color correction options or colorblind mode. Of the five stadiums, four are just fine for my dumb eyes. The fifth, however, is unplayable. Online matchmaking randomly picks a level from what I can tell, and when I land in that one particular stadium, I basically just run around with my head cut off. I can't tell which laser walls are mine, or even who my teammates are. Locally, I can choose the level, but again, the game begs you to play online, by way of its progression system. The audio is decent background noise, but every once in a while the music, especially the post-game tune, starts to grate on my ears. Most of the time though, it's harmless. Visually, there are some easily-identified silhouettes to identify who is playing which class, though in the heat of the moment it can still be hard to tell.